With each tale and tail wag shared here at Dog Pawsitive Tidbits, it has been my goal to live up to the light my dog Tidbit and her puppies shed unto my life over the span of fourteen years. It is my hope that you will enjoy the dog photos I share with you today, each on a plaque with a motivational message all its own. 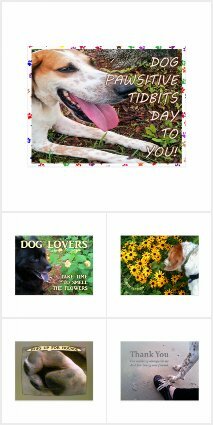 I have designed these images and dog pawsitive tidbits to be printed for purchase, displayed on 5.25" by 5.25" hardboard plaques. Each motivational plaque comes with its own easel stand attached. Of course I will be creating more of these photo plaques but for now ... Enjoy the dog pawsitive tidbits trio! Note: Click each image for a larger view. For additional dog pawsitive tidbits, I have published an article about living life to its fullest from the perspective of my teaching trio of dogs. It is a pleasure to be hopping along on Wordless Wednesday with the BlogPaws community. Add your picture paw prints to the blog hop! I am also delighted to be linking up for WW over at the Noner Says blog this week. Come join us there, too!